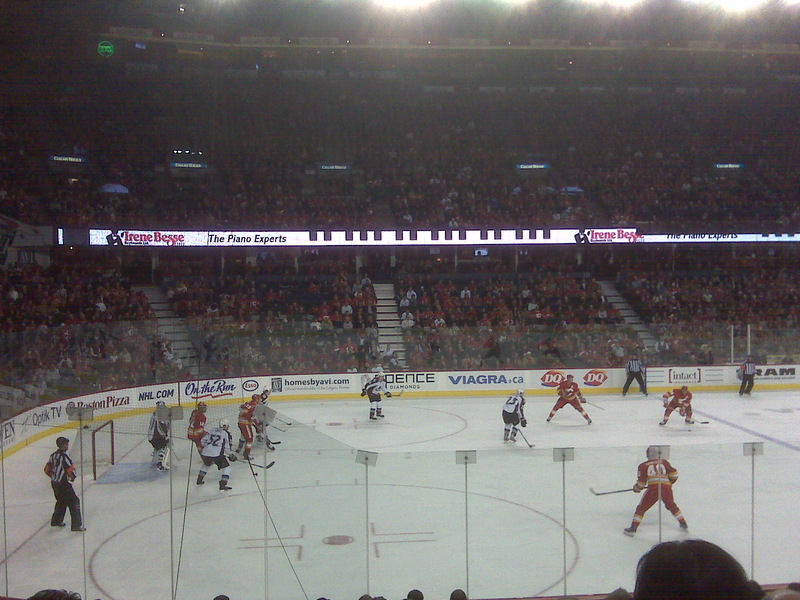 Hockey is the most organic way of understanding what it is to be Canadian. I grew up with hockey, every Saturday night on TV the Leafs and the Canadiens, every Sunday afternoon at the patch of ice behind the Presbyterian church and every other night at the rink shooting, skating and stopping goals. I love hockey and I love the Leafs- proof of this lives in my closet with my #25 Zezel jersey and while I did give 200% out on the rink the unfortunate truth was – I sucked! Still I loved hockey and while forced to play the girly version “ringette” I loved the game for the athleticism, coordination and foresight the amazing players exhibit. I spent many Saturday nights at Maple Leaf Gardens in the $12 Grey section where the insults, beer and armchair coaches swilled into a loud circus worth far more then twelve bucks! 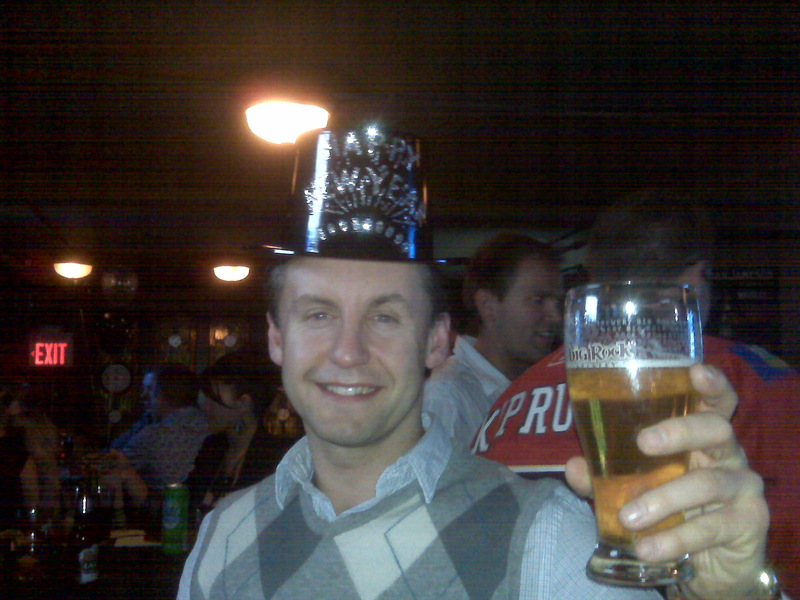 When I moved to Europe lack of NHL and a newfound passion for soccer stripped away a lot of my passion for hockey- happily it was rekindled on New Year’s Eve at the Saddledome. 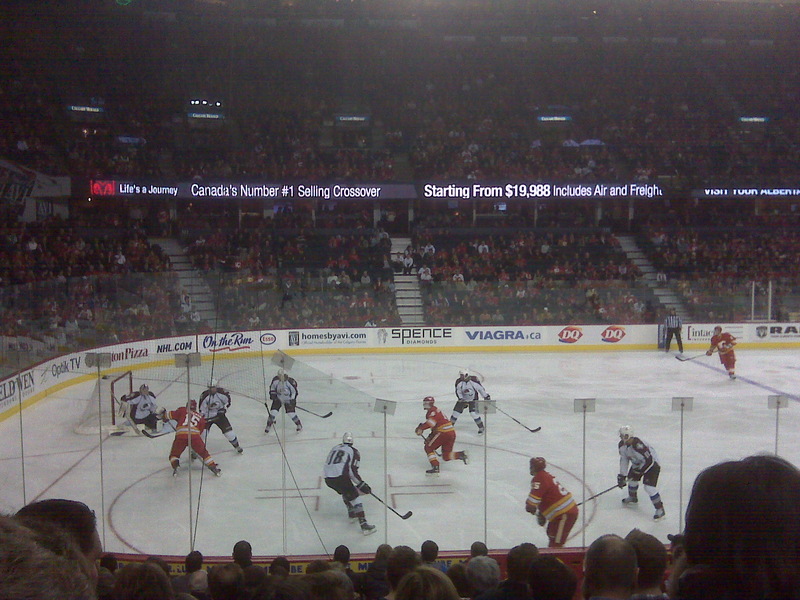 Friends of ours got us tickets to a Flames game and it was a great way to spend spend an evening. While the cost of attending at game is almost 10x’s what is when in my university days, the pleasure of watching a great sport with intensely passionate fans is well worth the cost. If you are a tourist – or live here and haven’t been to a game – you need to go because I truly believe it is one of the best ways to experience a unique piece of Canadian culture. Depending on the team in town, tickets may be hard to come by so make sure you do some planning. 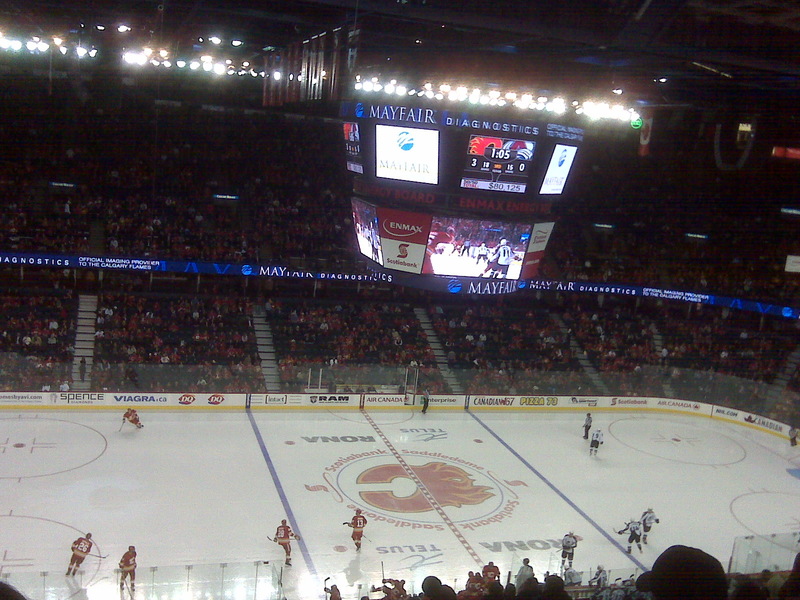 The Saddledome is an outstanding venue and I actually don’t think there is a bad seat in the house. We had the opportunity to sit further up in the stands where you get a great panoramic view of the whole game then we were able to move down and sit a few rows back from the ice where the action is so close you feel like you lace up and join the game! So take advantage of the season and get out and support the good ‘ole hockey game!